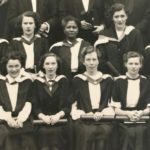 Dr Ansuyah Singh studied medicine in Edinburgh during World War 2, arriving in 1936 and completing her studies in 1944. 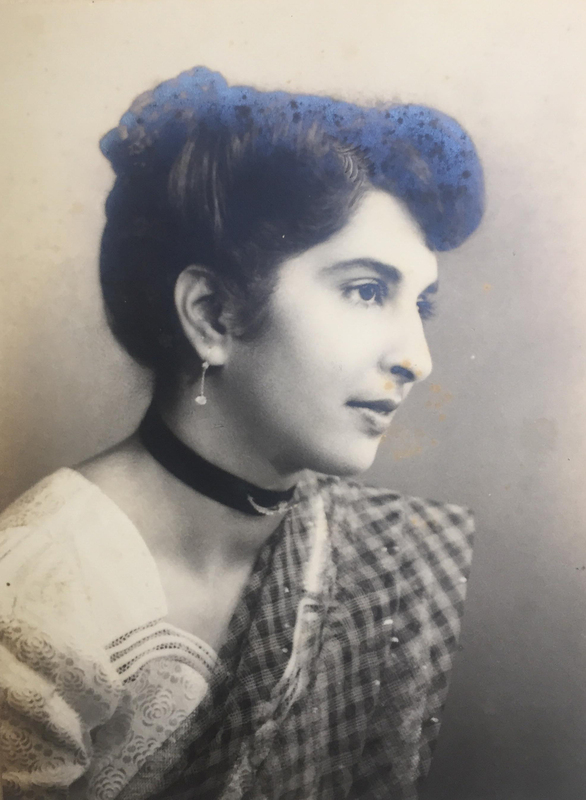 Born the eldest of three daughters to a middle class Indian family in Durban, Ansuyah’s parents, Latchmee and Chatrapul ensured Ansuyah and her sisters received an advanced education with private tuition from a young age (Natal Witness, 1947). Ansuyah was later part of the first cohort of students at the new Durban Indian Girls’ School (Natal Witness, 1947) She excelled in her academic and theatrical studies, becoming one of the first Indian women in South Africa to qualify for matriculation at a university (South African History Online, 2017). Her time at Edinburgh was defined by an appetite for experience and education of all kinds. Prior to the war she had the opportunity to travel extensively in Europe, attending Viennese music festivals and spending one “glorious holiday in Rumania” (Natal Witness, 1974). Her easy charm and creative instincts also brought her into Edinburgh’s prestigious intellectual and artistic circles. She built friendships with James Pittendrigh MacGillivray, the renowned sculptor and Scottish nationalist, who died before he could complete a bust of Ansuyah he had been working on (Natal Witness, 1947). She also inspired John T. Hunter, a future director of the Edinburgh College of Arts, to paint a portrait of her that was hung for a time in the Royal Academy (Natal Witness, 1947). At Edinburgh, Singh would also create lasting friendships with other South African Indian students, most notably Dr Kesaveloo Goonam. 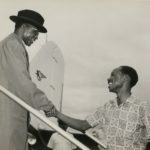 Their friendship was driven by a deep admiration for each others exceptional talent, as well as a shared commitment to the medical amelioration of poverty and oppressive rule in South Africa. They would orbit each other closely for most of their lives, albeit with turbulent episodes (Jarlett, 2018). Her travels and friendships informed a progressive philosophy that would define her life, in Edinburgh particularly she would write of finding an “international outlook” where “race, colour and creed did not matter. True intellect forbids and lifts people above such things” (Natal Witness, 1947). This internationalism was reinforced by the horrors of war Singh witnessed firsthand when she was attached to the Royal Infirmary in Edinburgh and the Bangour Military Hospital (Natal Witness, 1947). After graduating in 1944, Singh spent two years working in London hospitals before returning to South Africa (South African History Online, 2017). Here she established her own practice in Merebank near Durban that would evolve into the Happy Valley Medical Clinic. Established initially to provide family planning and other reproductive health services, the clinic eventually became general practice with Singh organising the clinic’s team of volunteers and attending every Sunday to personally treat patients (Jarlett, 2018). The clinic was unusual in South Africa for treating patients from all racial and ethnic backgrounds, the one stipulation for admittance was that you had to be “dirt poor” (Jarlett, 2018). At this clinic, the University of Natal and at the King Edward Hospital in Durban she would also teach and inspire a generation of young doctors in their studies (South African History Online, 2017). In her ambition to ensure medical security for Durban’s poor and marginalised she would publish at-least one survey of clinics, hospitals and social services to be circulated in the Indian community (South African History Online, 2017). Her commitment to social justice rooted in an internationalist philosophy, along with her first hand experience of the privations forced on African and Indian communities by Apartheid, led Singh to center herself in the heart of anti-Apartheid activism. She summarised her entry into politics best by noting, “In South Africa it is almost impossible to escape politics, and to many it is a form of self defense” (Natal Witness, 1947). In 1956 she became the first Indian woman appointed to the Natal Provincial Administration (South African History Online, 2017). From this position of establishment authority she organised Apartheid resistance activities. She penned numerous articles in Natal based publications in which she appealed for “Unity to Non-Whites”, imploring South African Indians to align themselves with Black South Africans in the organisation against white supremacy (Singh, 1952). She unapologetically endorsed resistance against the government, penning a column in which she writes “In the event of the Europeans failing to recognize this (the equality of non-white South Africans) then the Africans would have to pursue the struggle against the present entrenched political and economic system with determination and vigor” (Singh, 1952). Her political actions increasingly focused on bridging the race divide amongst women, seeing the greater education and emancipation of African, Indian and European women as the natural vehicle through which racist sentiment would be eliminated. She envisaged “the formation of an active corps of women Congress members which will eventually work in every district of Natal to..strengthen them and the people’s fight for liberation” (The Leader, 1952). Along with her activism Singh was deeply immersed in the artistic landscape of South Africa, as she had been in Edinburgh. She is well remembered for being the first published author of a novel by an Indian South African, with her 1960 novel Behold the Earth Mourns, that follows the experience of a young transnational couple from Bombay and Durban respectively, illustrates what one scholars called “a highly racialized topography through which Indians move in concert, and sometimes in collision, with black South Africans.” (Burton, 2010). She is less well known for her own performance career, notably playing the titular role of the “dancing girl” in a Johannesburg production of Natir Puja (The Devotion of the Dancing Girl). The story is a critique of caste inequality and religious prejudice, and it’s proceeds were in aid of a fund for providing higher education bursaries for non-European students (The Star, 1952). The more playful, creative side of Singh was often noted by those that spoke with her, one interviewer remarked that he was surprised to find a woman “who does take herself and her work seriously but who yet finds ample time and capacity to laugh and enjoy herself” (Natal Witness, 1952). Ansuyah Singh’s legacy as an esteemed doctor, radical activist and creative muse are testament to her truly extraordinary mind. She utilised every tool in her arsenal of talents to instigate progressive change in her society. Be it from a clinic, a stage, a committee or the page, Ansuyah always found a way to deliver her message. Driven by her ‘international outlook’ she helped to realise in Natal, “the dream, without which the individual no less than the nation, perishes…..a practical application of the greatest of Lincoln’s undying truths, that all men are created equal” (Natal Witness, 1952).